The second largest island of the Dodecanese has no equal. It holds on dearly to its past in its ancient acropolis, caves, churches and even its traditional dress. The setting is dramatic in all the best senses of the word: stunning vistas from untouched, cliff top and mountainside villages that defy gravity and a fearful hammering from the wind to keep vigilant watch over the Aegean. In Karpathos you’ll discover an island with its Greek soul intact, living traditions, people of real character, musical skills passed down the generations and legendary festivals – untarnished by modern fads. Exposed to the winds, Olymbos balances on a rough-hewn, remote ridge like a tightrope walker. Its houses spill down the slope seawards, tightly bound to each other and rooted in the rock. This harsh, wild place kept pirates and marauders at bay, and it still resists intrusions by today’s more peaceful invaders. Just what you’d expect from a town that has been defying the tides of time since the 9th century. In a single glance, you can take in a wealth of clues as to the cultures that have had an impact here. Among the significant sights and attractions are early Christian churches, ancient Vroukounta and Arkesia, the castle and the acropolis at Aperi, the Roman cistern at Lefko, the beehive tombs at Karpathos town and Arkasa. And then there are the more recent structures left by the Italians, such as bridges, aqueducts, wells, windmills and the outdoor ovens of Olymbos. Don’t miss this opportunity to travel back into the past. On this island, it’s as if time has stood still. Here you will find an authentic Greece, like something out of a bygone era. Many women still wear the traditional dress, while men harvest their crops with scythes. Men and women sit separately at village festivals, where musicians play the bagpipes, lyre and lauto, crafted on the island, and sing in the style of their ancient ancestors. In northern Karpathos you’ll find even older, sometimes strange customs still practiced faithfully. The festivals have to be lived to be believed. The award-winning sandy crescent of Apella is the most beautiful beach on Karpathos and a contender for one of the best in the entire Mediterranean. Emerald waters will also tempt you in at Kyra Panagia, Ahata, Lefkos and Ammopi – only the beginning of a long list. The north, above Olymbos and all the way to Saria, is a favourite haunt for birds, seals, frogs and salamanders as well as the home of large, tasty but elusive fish. There you’ll also find the palaces of Doric Nisyros, sacred ancient Vroukounda and exotic Tristomo. It’s like stepping into another world. In Karpathos, the plateau of Avlona invites you to travel in time around its meticulous patchwork fields, barns, scattered farm dwellings and crofts. You just pick the century. If there is a hiker-paradise in the Aegean, it must be on Karpathos. Centuries-old cobblestone paths lead to forgotten ancient sites, roadless villages without electricity or other mod cons and breath-taking views. The hiking trails crisscross the island but are best in the north. Karpathos, along with the islet of Saria, is one of the most important islands in Greece for the protection of rare species and ecosystems. Two sites are included in the Natura 2000 network for their bird and seal populations. The most famous village in Karpathos island, with great history and amazing panoramic views. Olympos is located in the North of Karpathos, build on a mountain ridge. The village was not accessible by car until recently, but today Olympos is connected by asphalt road to the south. 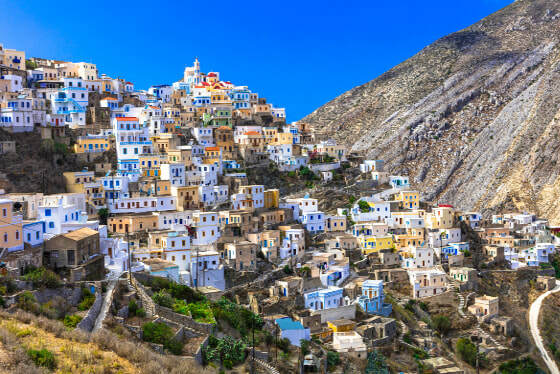 For centuries the one and only connection with the outside world, and with the other villages of Karpathos was the port of Diafani. The locals are very proud of their traditions, the women in Olympos wear traditional costumes every day. There are two types of these clothes: one is for weekdays - a black colored apron and a simple scarf around the head-. If they are celebrating, the women in Olympos wear colorful clothes and a double row of gold jewels. Because of its traditions, people say that Olympos is a living folklore museum, with idyllic atmosphere. The Mediterranean diet is scientifically proved to be the healthiest way of acquiring wellness and longevity.Karpathos is the source of Mediterranean cuisine. Come and cook its delicious traditional dishes using virgin olive oil, pure honey and biological products from the gardens of Avlona.During the programmes we will have the opportunity to prepare a delicious, kneaded bread together with the local housewives and light the traditional wood stove to bake it! We will also take the most widely known traditional dish of Karpathos, the so-called ‘makarounes’ i.e. fresh pasta sprinkled with grated goat cheese and sautéed onion. We will stuff courgette flowers and grape leaves we will cook goat meat in a casserole and many other traditional dishes. Finally, we will fry delicious traditional doughnuts (loukoumades) topped with the pure honey of Karpathos! Anyone hungry? According to mythology, the island was created when Poseidon in titanic battle as he struggled with Titan Ephialtes, he cut off a piece from Karpathos side and buried under this opponent. Ruins of the city are sunken in the Strait of Tristomou, between Karpathos and Saria. Signs indicate the existence of Apollo Porthmiou sanctuary. There are traces of human presence since the Neolithic Age and the early Bronze Age, and since historical times have been found remains of fortifications on the west side of Castello hill. Remains of settlements are in Argos (north) and Palaces (east), where excavations have revealed several findings. Palaces have beautiful beach with a few trees. Furthermore, the island is an important habitat and breeding site for birds and marine organisms. Note that the northern Karpathos, Saria, and the sea area around them, belong to the European network of protected areas Natura 2000, thanks to the variety of habitats available and rare plant and animal species that host. and plenty of other activities that are sure to leave you speachless! We will surely offer you a life time experience! You can choose from the activities mentioned or just let us organize the ideal adventure trip for you based on your interests!